A living history of the Vietnam war typically is not part of an educational curriculum. 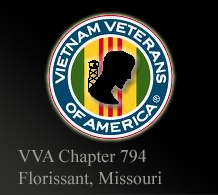 The Vietnam Veterans of America (VVA), Chapter 794 in Florissant would like to change that with it's "Through Our Eyes" Educational Program. Created by members of the local organization, the program places a Vietnam veteran in front of the class to share firsthand knowledge of a part of America's history. Students are invited to ask questions related to the Vietnam war era, and get answers that are honest and accurate/ "Through Our Eyes" can serve as an insightful supplement to a teacher's curriculum and peak a student's curiosity in history. As a "last man" organization, the VVA will come to an end when its last member dies. it is now all the more important for it's members to share stories about their experiences in Southeast Asia, and how this part of America's history actually unfolded, before it all is lost to the ages. "Through Our Eyes" already has exposed hundreds of St. Louis area students to the real history of the Vietnam War. Members of VVA Chapter 794 have visited classrooms in the Ferguson-Florissant, Hazelwood and St. Charles school districts, and have received positive feedback about the program from both students and teachers. Entering the classroom, however, is but one way the members of VVA Chapter 794 are present in the community. In addition to its continuing pledge to assist Vietnam veterans in a number of ways, the organization donated to the Hazelwood and Florissant police departments bullet proof vests to protect their K-9 units. The group also donated to those departments other K-9 assist technology. And after and 18 month planning process, VVA Chapter 794 brought to Florissant in the summer of 2003 the Vietnam War Memorial's "Traveling Wall," a scaled version of the original memorial located in Washington D.C. During its week long visit, more than 42,000 people visited the "Traveling Wall" and its related displays and programs. To date, the project is considered Chapter 794's crowning moment and most proud accomplishment. If you would like to schedule a visit to your classroom, do not hesitate to contact us at info@vva794.org.